Welcome to Nails by Tammy! Nails by Tammy – We are a family owned and operated salon that first openedour doors in 2011 and we have grown tremendously since then with the help of our loyal clients. With our extraordinary service combined with a fantastic clientele base, Nails by Tammy is proud to berecognized by Bethesda Best magazine as one of the best nail salons in downtown Bethesda. We take pride in our professionalism and the high standards that we set for ourselves so that we can carefully cater to the individual needs and satisfaction of our clients. 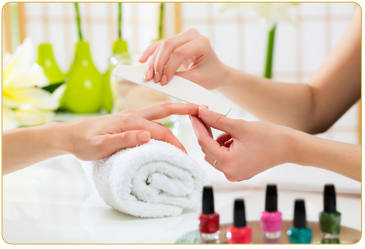 At Nails by Tammy, our staff always works tirelessly fueled by their talent and passion to ensure that you will experience high quality service that is complemented with the most current and advance nail care products available. You will be treated carefully and thoroughly on every visit, especially since we take special precautions to sterilize every piece of equipment before use because sanitation is always one of our highest priorities.